The main aim of Brainware Group of Institutions is to make its students become job ready and employable. It specializes in several job ready courses in Kolkata. So keeping in tandem with this aim, Brainware has an elaborate and intensive pre placement procedure that takes place from day one - in order to make the students more job ready and crack placement interviews easily. Pre placement refers to a procedure that makes the graduates ready for placements. An organized and exhaustive pre placement procedure is needed in order to hone the soft skills of the students, make them more comfortable in interviews as well as give them an opportunity for learning practical application of their knowledge through internships and industrial trainings. Therefore, in order to make students more employable, Brainware follows a three-pronged pre placement procedure. The first step is one of the most crucial one wherein students are trained on essential soft skills like communication skills, group skills, presentation skills, interview skills etc. The second step comprises of numerous industry interfaces with leaders and professionals of the industry, which helps students understand the recent trends and also build networks to leverage their career. The third and final step consists of management labs and internships ( for commerce and management graduates) where the students learn to solve real world business problems through live projects and case studies and also get an exposure to corporate work setting via internships in top firms. For the engineering graduates, the pre placement process remains pretty much similar - except for them the pre placement process ends with industrial training period in renowned public as well as private sector firms where they learn to solve real world technical problems and get an opportunity to apply practically all the theoretical knowledge they have amassed through their under graduation /post-graduation. Through this three step pre placement procedure the students are trained to become consummate professionals. They receive hands on training, in several soft skills such as English speaking skills, presentation skills, negotiation and HR Skills and become the ultimate management professional with excellent technical as well as management skills. With the help of a state of the art language laboratory, our in-house soft skill experts train our graduates and help them develop and hone their soft skills/English speaking skills. The students are trained to read, write, and speak in flawless English fluently without any pronunciation mistakes. The students are also trained in how to deal with stress interviews from day one so that they can crack any interview no matter how intensive or taxing. Other soft skills like body language, group dynamics, lateral thinking etc. are also taught here. The industry interface programs are held, keeping in mind the need to provide the students a chance to interact with seasoned professionals and leaders of their field. Through these interfaces the corporate leaders help students to learn how to handle corporate problems on a daily basis. 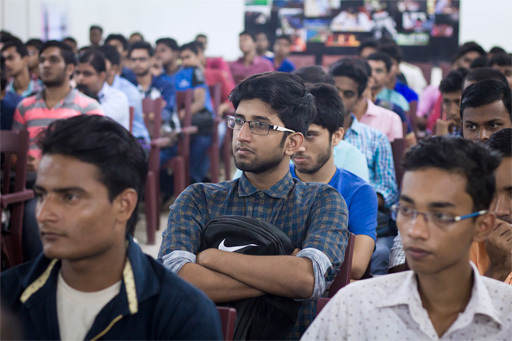 Brainware is one of the few MBA colleges in Kolkata, AICTE approved and amongst the top 10 BBA colleges in Kolkata, that provides such an exhaustive and meticulous pre placement training for management undergraduates and graduates. The Brainware Management Lab is a hub of practical training .This is the place where the management students learn how to apply everything they have learnt to solve real world business problems. Management Lab programme at Brainware consists of two aspects viz - live on the job projects in sectors like retail, home delivery and start-ups and internships at top firms. The Management Labs are designed by highly experienced industry veterans with the aim of making the management students capable of handling real world business problems efficiently. The second aspect is internship at top companies where students get adequate exposure to real business environment and learn how to solve real world business problems. All these facilities are packed into an intensive programme available at surprisingly affordable rates. Brainware thus offers top MBA in Kolkata with low fees that guarantee to make graduates desirable to any employer. This is a programme exclusively for graduates pursuing B. tech courses. We arrange industrial trainings for our graduates in renowned public as well as private sector companies such as Durgapur Steel Plant, IBM Bangalore, Hindustan Aeronautics Limited etc. Through industrial training, the students get practical on the job experience and also get an opportunity to exercise their theoretical knowledge to solve real life technical problems.